Flats boats benefit from the use of jack plates to allow them to move the engine vertically upwards to get into shallow water. In addition to the power tilt and trim system that swings the engine around a pivot point on the mounting bracket, flats boat operators find it useful to be able to move the engine mounting bracket itself up and down on the transom. A hydraulic outboard jack plate is mounted to the transom of the boat, then the outboard engine is mounted to the moving part of the plate. 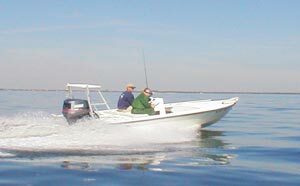 The boater can then move the engine up and down as well as tilting it in and out with the power tilt and trim. The jack plate has several uses, most involving shallow water operation. If an engine has no jack plate, it must be mounted low enough so as not to cause cavitation when running into chop, or when executing turns. In calm water on a straight course, it could be mounted higher, and that's where the jack plate comes in. Jacking the engine up to go across shallow water works better than tilting the engine out in most cases because tilting to high angles puts the cavitation plate in front of the propeller, encouraging cavitation. Lifting the engine vertically keeps the plate above the propeller and aligned with the movement of the boat. Also, a tilted engine throws a rooster tail of water up into the air. If you throw water up, Newton's Law says it must push you down equally hard. You're in shallow water, and don't wish for the boat to be pushed down, especially at the stern. An engine tilted at a high angle to go across shallow water will raise the bow and lower the stern of a boat. A boat equipped with a jack plate can avoid all those negative consequences of tilting the engine, by simply raise the engine up with the jack plate until it is on the verge of cavitation. A jack plate also increases fuel efficiency, because the engine can be raised as high as any given set of operating conditions will permit for cruising. The less engine you must drag through the water in order to get thrust from your propeller, the better. It may need to be all the way down if it is rough, but calm conditions will allow you to run with the engine higher. Hydraulic jack plates also are useful when it is necessary to get a boat on or off plane in shallow waters. To get on plane, the plate is first raised all the way up, then full throttle is applied and the power jack plate is simultaneously started down. As the transom squats in the water initially, the engine is still high enough to miss the bottom, and cavitation is not yet a problem. As the boat starts to come over onto a plane, the engine is starting to arrive down at the proper level for high speed cruising. Slowing down into shallow water is essentially the reverse of the above procedure. As the boat is slowed down, the jack plate is raised, and some also tilt the engine out at the same time, so that when the stern of the boat is at the lowest point coming off plane, the engine is already jacked up high and tilted out a bit to minimize draft.